Forecast: Preaching Trainer has two of our favorite angles, stretching out for the first time after two sprints, and removing blinkers. The Gaines-trained gelding remains protected in a sign of confidence, switches to Van Dyke, and projects to inherit the role as the controlling speed. 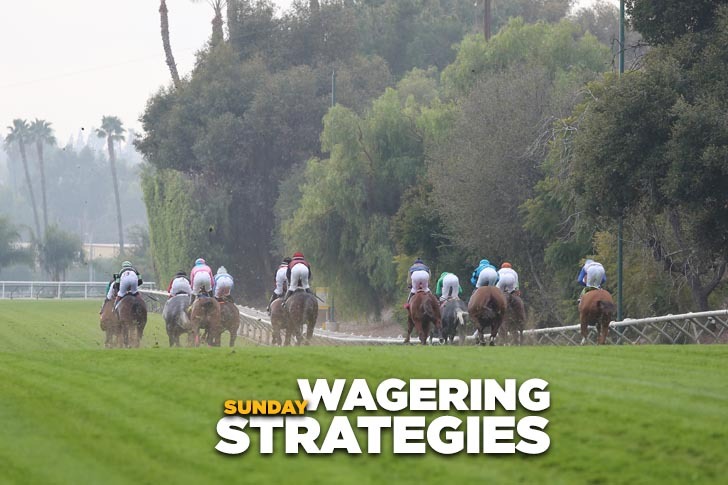 In what appears to be a below par field for the level, we’ll make him a straight play and rolling exotic single at or about his morning line of 3-1. Forecast: Bellerin and I Can Do This just finished one-two in a restricted (nw-2) $40,000 claimer over a sloppy surface and both should run well right back in this starter’s allowance affair. There’s really little to choose between the two (they’re both 5/2 on the morning line), but Bellerin has won two of three over this main track and may be a tad more dependable. In a race that we’ll otherwise pass, both should be included in rolling exotic play. Forecast: ​Victory Element is back sprinting where he’s probably most effective, is comfortably drawn outside, and beats these if handles the surface in this abbreviated turf dash for maidens. Overdue flashed good early speed before weakening late in a hillside affair in his debut in February. With that race under his belt and at this shorter trip, the D’Amato-trained gelding seems certain to improve and be a strong factor throughout. Forecast: Denman’s Call is listed as the 8/5 morning line favorite in this $25,000 claiming extended sprint and likely will go lower in a five-runner race that should be his for the asking. The veteran gelding caught a tough field for $32,000 and was outrun last month, but he shows a healthy work pattern since and really doesn’t have much to beat. He’s a short-priced, no value, rolling exotic single. Forecast: Love and Peace was given too much to do when forced very wide in a similar first-level allowance affair in late January and took hold too late as the favorite. She switches to Prat, shows a bullet recent workout, and should be able to secure a good second flight, ground-saving position and then be along in time. She probably won’t offer all that much value – she’s 9/5 on the morning line – but she can serve a purpose as a rolling exotic single. Forecast: ​Beach View is effective on any surface but his one-paced, grinding style probably works best on dirt. His win in the Cougar II Handicap under these conditions is good enough to beat this field, and with the switch to Prat, the veteran son of Giant’s Causeway looks hard to deny. The improving Acker makes his first start since being claimed for $62,500 by Sadler and on paper should be the controlling speed. If not respected, he could take this field a very long way. Forecast: Breezy Bee broke slowly, fell far back, and then made up as much ground as she could when fourth in a similar maiden $50,000 turf miler last month. With a better break today, she’ll lay closer up and then have every chance to wear down the leaders late. Field Bet finished fourth in her debut with a fair amount of trouble and was promptly claimed by Sadler. She gets a break in the weights with the switch to bug boy Velez, stretches out to a mile, and seems likely to produce a significant forward move. We’ll use both in our rolling exotics while slightly preferring Breezy Bee on top. Forecast: Teacher’s Treasure returns to his preferred surface – dirt – and we’re expecting the son of Square Eddie to take control early and keep on going, especially with the addition of blinkers. The Truman-trained gelding catches what projects to be a favorable pace scenario and makes a monumental jockey switch to Prat. At 6-1 on the morning line he represents strong value both in the straight pool and in rolling exotic play.